Please take a moment to sign the Obesity Action Coalition (OAC)'s petition to ask iTunes, Apple, Google, Microsoft, etc. 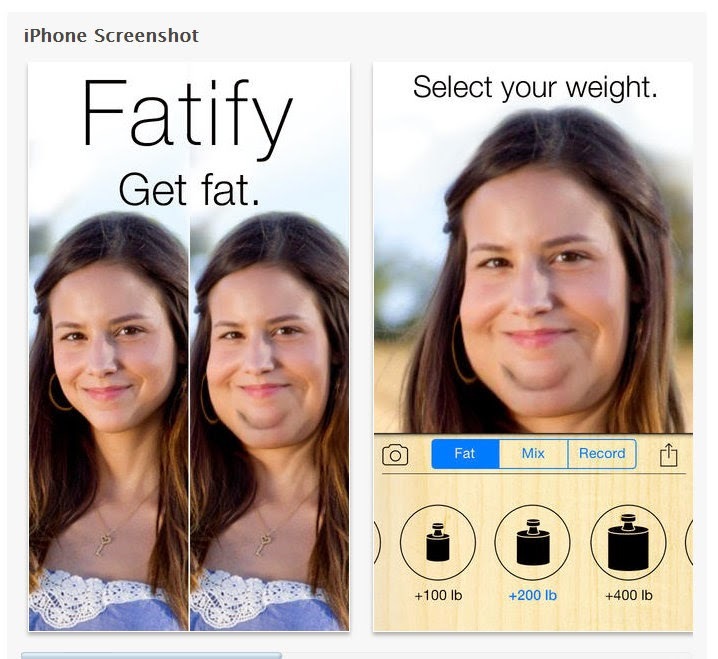 to remove fat shaming apps like Fatify, Fat Booth, Fat You! and others. Obesity is not a laughing matter. It is a disease. One that killed my father, and one that nearly killed me. There is nothing funny about it. It hurts my heart to think of the kids that will be made fun of or taunted with crap like this. Studies (via CDC) show weight is likely the leading cause of bullying and one study even showed that nearly 20% of girls who faced weight bullying attempted (not thought about, ATTEMPTED) suicide. Time to put our foot down and nail stuff like this when we see it. Thank you for adding your name to the PETITION and for SHARING this petition on your social media accounts. Take a further step and use this easy form to send letters to the CEO's of the above companies. A day in my pouch is a series of blog posts to show what a typical daily menu looks like in my post weight loss surgery world. Here's what I ate today. Hope it give other post-op a few new ideas. The blog is a recommended site by many bariatric programs but everyone's program is different so keep that in mind and when in doubt, print it out and get the thumbs up from your program. Breakfast: I am so done with summer. Summer however isn't done with us as apparently it's going to be nearing triple digits this week. Ugh. I can not wait for Fall. 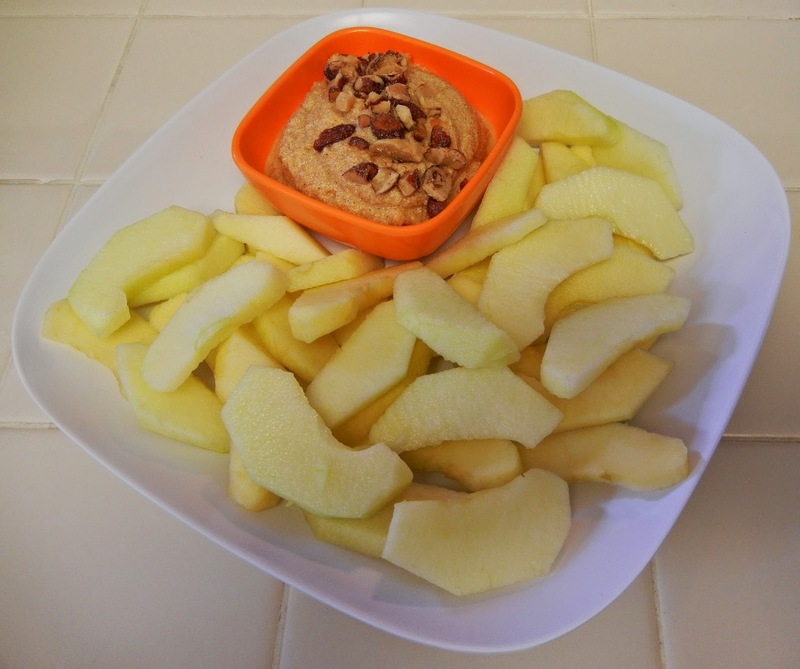 I was wishful thinking yesterday by breaking out the pumpkin for this protein packed dip. Mix all ingredients together except crushed almonds (sprinkle those on top) I used Sugar Free Vanilla Syrup (SF Caramel, SF Pumpkin Pie, SF Brown Sugar Cinnamon, SF Vanilla Bean all would be yummy or honey if you don't do the SF Syrup thing) I used Blue Diamond Honey Vanilla Almonds (put them in a snack sized baggie and crushed them with a can) for a little crunch factor. I dipped Fuji apple slices but this dip would be great smeared on ricotta pancakes or as a filling for crepes. Lunch: I took a gorgeous tomato I bought at the Farmer's Market on Saturday, sliced it and spooned one of those Starkist Tuna Creations Packets on top of the slices. 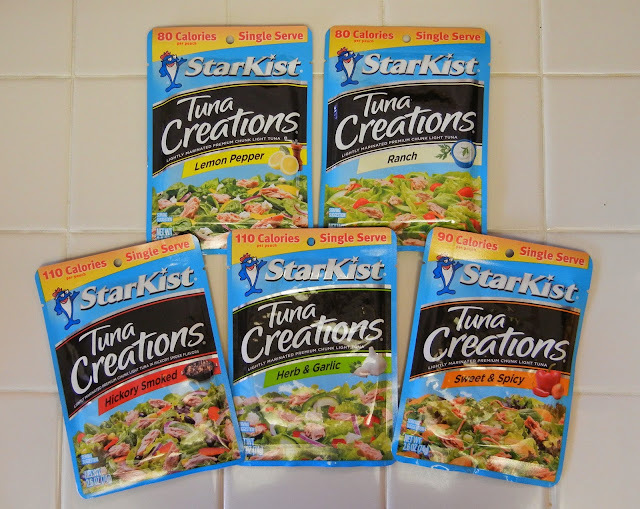 Have you seen all of the flavors of these tuna packets they have now: Lemon Pepper, Ranch, Hickory Smoked, Herb & Garlic, Sweet & Spicy, well and Plain of course. They are between 80-110 calories each. Oodles of protein between 16-19 grams per pouch. I have found them for around $1 at my local supermarkets and Walmart, so a super cheap protein packed lunch. My favorites are the Herb and Garlic and Lemon Pepper. You can eat them right out of the pouch. They really don't need anything added. You can of course make tuna salad with them. Add Greek yogurt, chopped celery, pickle and all that but I just spooned it straight out of the packet onto the slice of tomato, a few twists of black pepper, sprinkle of sea salt, topped it with a slice of really good cheddar cheese and broiled it till it was all melty and bubbly. Voila. 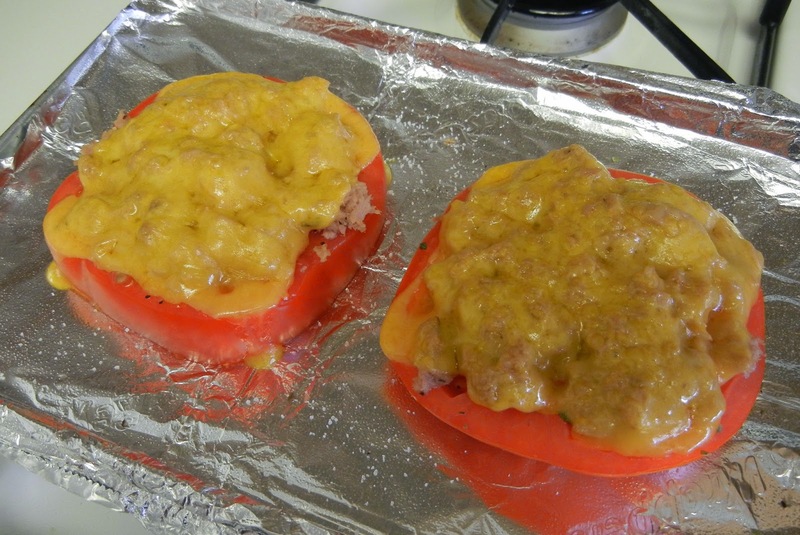 A breadless, low carb, tuna melt. A single tuna packet made 2 tuna melts and 1 was plenty for me for lunch. Dinner: This was a perfect Meatless Monday dinner, lots of protein from the eggs. cheese, Greek yogurt. If you wanted you could serve these with a green salad or bean salad or topped with a egg for dinner or breakfast. I had them as is with a dollop of yogurt dip. 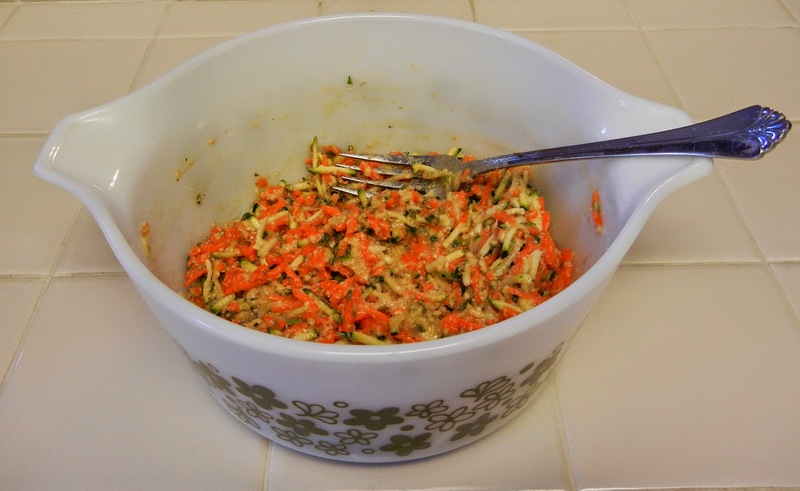 Shred the carrot and zucchini. Let sit for about an hour in a colander, allowing them to drain. Squeeze to remove any remaining liquid. The veggies should be fairly dry. Mix all the ingredients together. 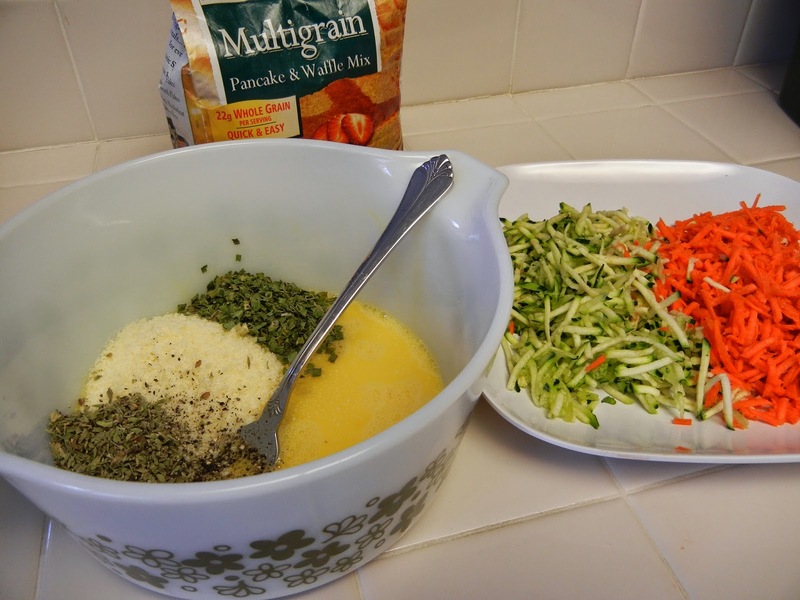 I just bought a veggie spiral slicer so next time I make these I will give that a try... this time I just used my shredder attachment on my Kitchen Aid but you know those big things are a pain to clean. Hoping the little gadget works like the infomercial says it will. You could even just get a scoop of shredded veggies from a to-go salad bar if you have one in your local supermarket. We have a couple of great ones and sometimes when I just need a little bit of something it's easier to buy a scoop or 2. Not as cost effective usually but convenient and less cleanup. Using a 1/4 cup measure make patties. Place in pan and flatten slightly. I saute 4 at a time in a 10" non stick pan with a Tablespoon of oil on medium heat. Cook about 5 minutes on one side. When you see the edges are golden, flip and continue about 5 minutes on other side till golden brown and crispy. Makes 6 patties. Leftovers keep in fridge for a few days. 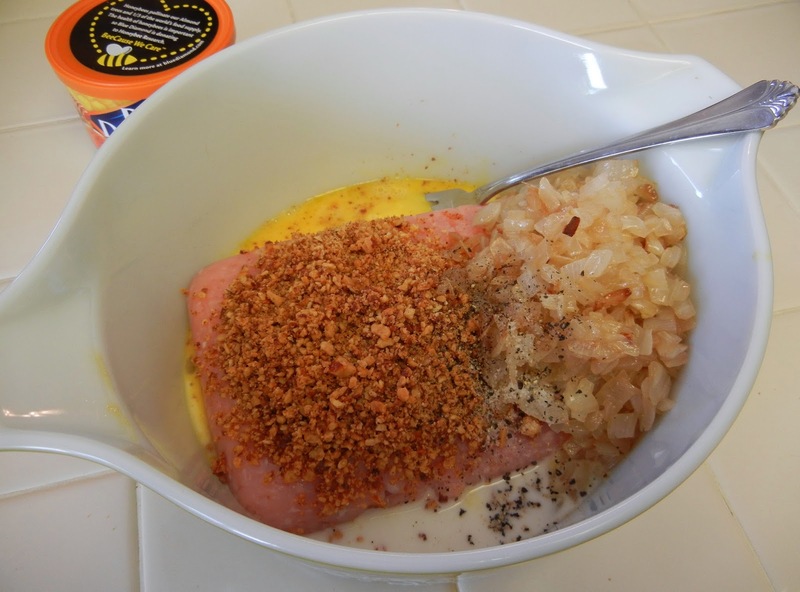 To reheat, nuke a minute then place under the broiler a few minutes to crisp back up. 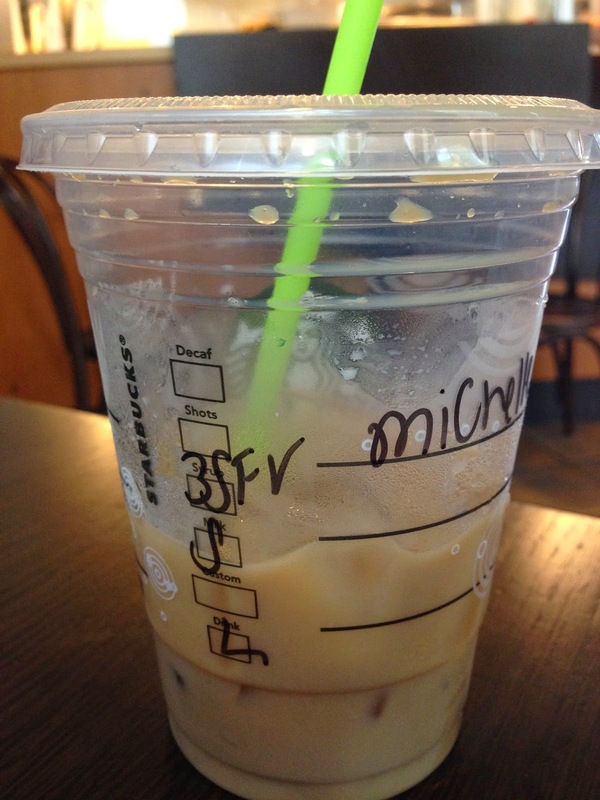 Snacks: Lots of coffee at the house and while I was out and about I made a Starbuck's pit stop and had a 3 pump (Grande usually has 4) Iced Sugar Free Vanilla Soy Latte. and about 3/4 of a bag of Kay's Cinnamon Almond Protein Cookie Bites when I watched a little of the Emmy's last night. I like to watch the arrivals after that I lose interest. I wanted to see the Robin Williams tribute. I haven't been as affected by a celebrity death before. Princess Diana is one that comes to mind but I think because Robin's movies have been such a part of our lives for years that it really did feel like a family friend had died. I've been wanting to pop in Good Will Hunting or Dead Poet's Society and have my own tribute day, maybe this weekend. I've got a few fun things coming up very soon on the blog so you will want to check in and be sure to friend me on Facebook and Twitter to not miss out on any of the fun! Thank you to all who entered The World According to Eggface and Celebrate Vitamins NEW 2 in 1 Protein and Calcium Bar Giveaway. Congratulations to the 10 winners! 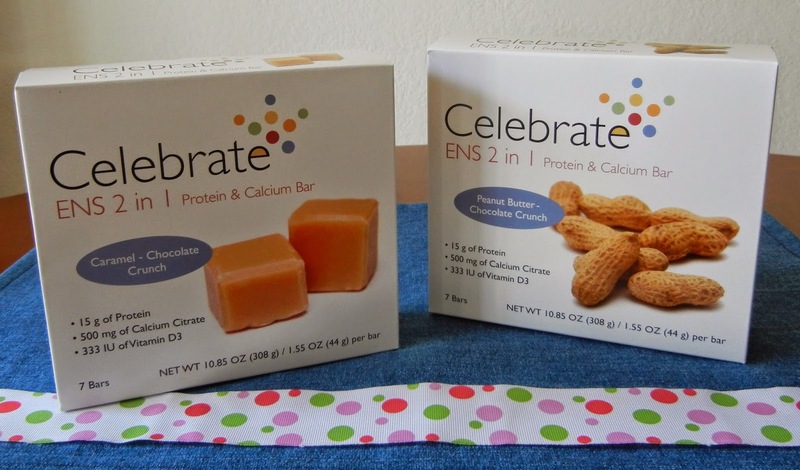 KayDawn M., Melanie D., Amanda M., Tara P., Amy M., Kathy C., Heidi P., Maryann F., Ron T., and Kelly P. You each have won a 7 bar box of Celebrate Vitamins NEW 2 in 1 Protein and Calcium Bars. You have mail! Not a winner this time... no worries another Eggface Giveaway is beginning very soon be sure to follow along on the Blog, Twitter, Facebook, or Pinterest for the latest eggciting announcements! Protein bars are an easy and portable protein source. Pop one in your purse or carry-on and you are sure of something healthy and on plan to power your day. I always have a protein bar on me. You never know when your appointment will run late or plane will be delayed when traveling. I have checked-in to a hotel later than anticipated only to find my choices for dinner were a late night room service menu of overpriced deep fried foods or a vending machine filled with 400-calorie who knows how old pastries. My secret protein stash has saved me many a time from making a not so healthy choice under stress. We know that we’re more likely to eat the wrong foods when we’re stressed and I just read a study that said that stress-induced changes to metabolism could lead to an 11-lb weight gain in an average year. Set yourself up for success and as those little Boy Scouts tell us "Be prepared." 15 grams of Protein PLUS... 500 mg of Calcium Citrate and 333 IU of Vitamin D3 per bar. Very cool! High protein snack (Between 130-140 calories) comes in 2 delicious flavors: Peanut Butter Chocolate Crunch (peanut butter and chocolate, classic combo) or Caramel Chocolate Crunch (rich, sweet caramel flavor. Mmmm I want the world to smell like this bar... the aroma is divine.) These are soooo good. A great new portable protein source that is ready to go on your next big adventure or small adventure navigating the break room of temptations each day at work. Want to learn more... LIKE Celebrate Vitamins on Facebook and tell them The World According to Eggface sent you over to check out their new bars. Here is the link to order them. 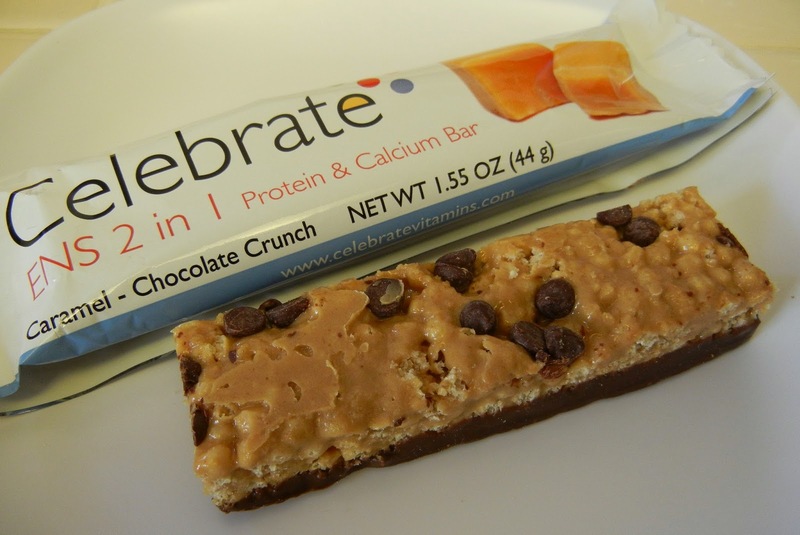 Oh and heads up: I just read that in every Celebrate Vitamins online order through August 31, 2014 you will receive one Free Caramel-Chocolate Crunch Bar and one Free Peanut Butter-Chocolate Crunch Bar so now is the time to get your vitamins refilled. The Celebrate Vitamins gang have graciously offered 10 of my blog readers a chance to win a box of bars. It's GIVEAWAY TIME! The Prize: 10 Winners! 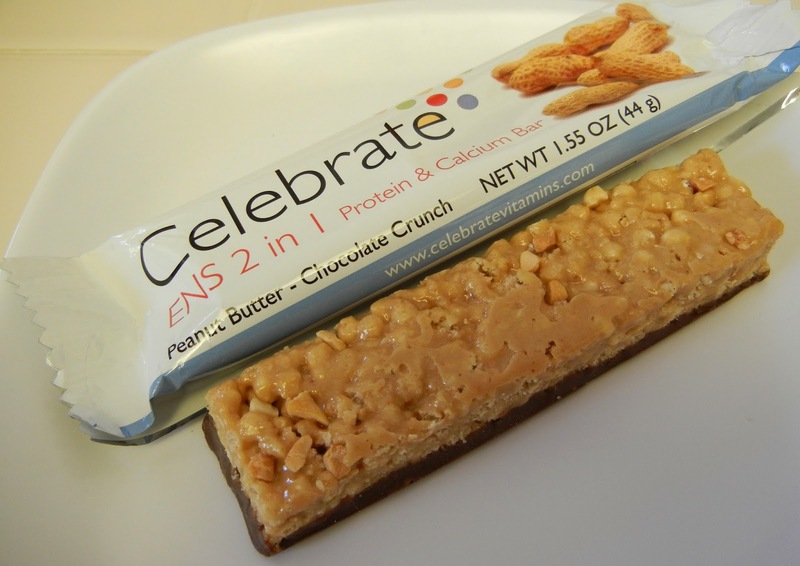 will each win a 7 bar box of Celebrate Vitamins ENS 2 in 1 Protein and Calcium Bars in the flavor of their choice: Peanut Butter Chocolate Crunch or Caramel Chocolate Crunch. How to Enter: 1.) LIKE The World According to Eggface and Celebrate Vitamins Facebook Pages 2.) COME BACK HERE and LEAVE A COMMENT on this blog posting (include a name and some email address where I can contact you if you are the winner) Scroll down to # of comments below to leave yours. That's it, easy peasy. Optional for fun: Share in the comments where you will be (or would like to be) enjoying your bars if you are a winner! Me: I'd love to be packing my ENS 2 in 1 Bars for a trip to Sicily. When Celebrate Vitamins asked me to try their latest product and share the news I was excited to. You know I love to try new things. The products (including the nom nom nom samples I gobbled up for this review) and the nutritional information have been provided by Celebrate Vitamins. The commentary and opinions are all me. 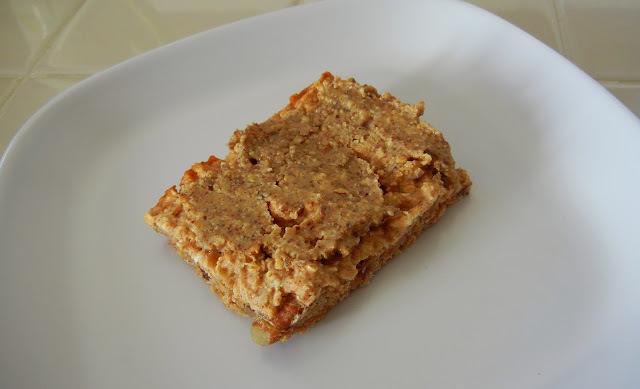 Breakfast: I made a batch of my homemade protein bar squares (cross between a protein bar and an oatmeal cookie) in the middle of the night when I woke up and could not make myself go back to sleep. When the sun came up I smeared one with some almond butter and took it on a quick walk around the block. When I got back I pulled one of my make ahead smoothie bags out of the freezer. This is a huge time saver. Instead of having to pull all the ingredients, tubs of protein, cut up fruit, etc. 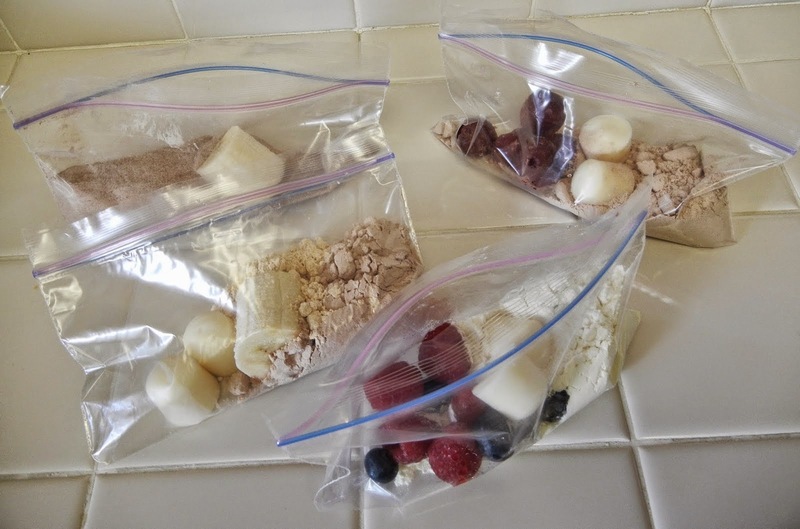 all you have to do is dump the contents of the snack sized baggie in the blender, add milk and voila. Be sure to label them or you may forget what's inside or you'll have to play guess the mystery shake. 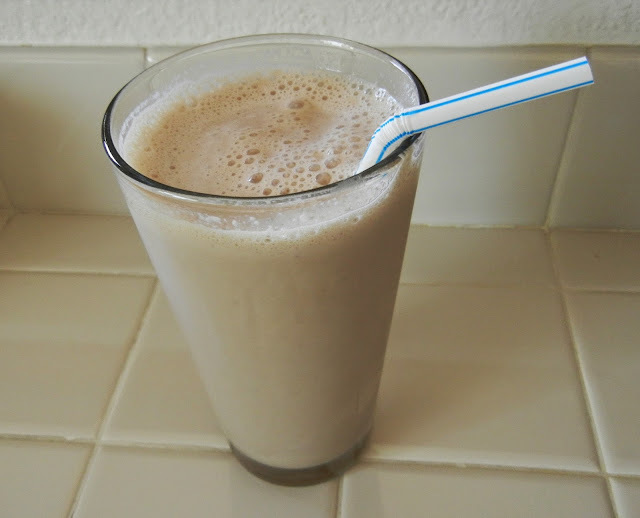 Today's was an Iced Coffee Banana Mocha-chino made with Chike High Protein Iced Coffee. Lunch: I believe I am officially warming up to quinoa. It took me awhile but I have a few recipes now I really enjoy. I love this latest recipe because I always seem to have 1 leftover cup of quinoa when I make my favorite Quinoa Patties that sometimes goes a-begging. This is the perfect use for it. Preheat oven to 350. Mix all ingredients together. 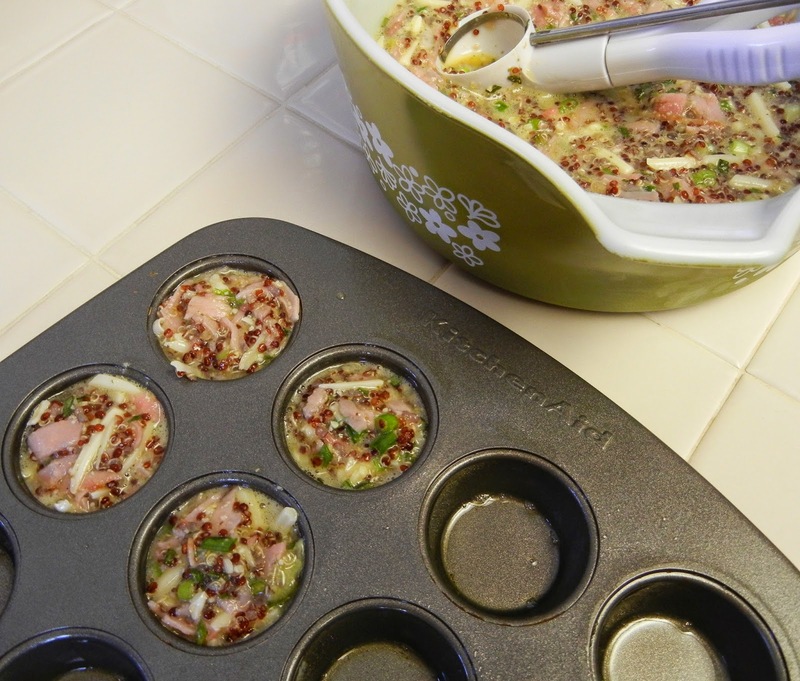 Spoon into lightly greased (Pam non-stick spray works great for this) mini muffin tins. Dinner: I was gifted a sample of Progresso's new line of chili. You can find the chili in the soup aisle but it's not in a can, look for a pouch (with a clear bottom so you can spy on all the ingredients.) They have 2 flavors: Smokehouse Pork and Beef Chili with Beans: andouille sausage, beef, tomatoes, onions, green peppers, pinto and red kidney beans with a little spice kick (nothing to hot but hot enough you know you are eating chili) and Southwest Style White Chicken Chili with Beans: white meat chicken, white beans, green peppers, tomatillos and onions. I haven't tried my sample of that one yet. 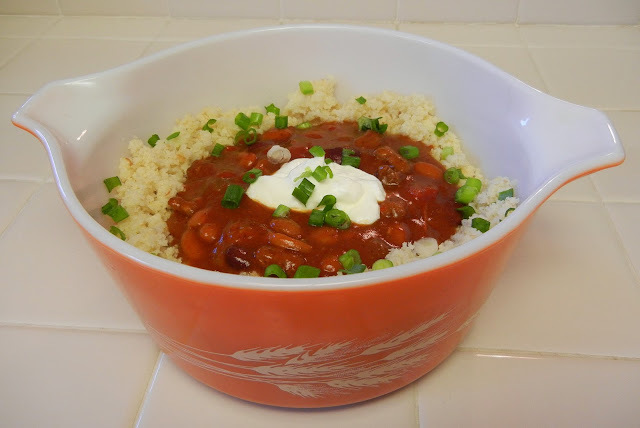 If you are looking for a quick and easy dinner grab one of these chili pouches when you spot them in your supermarket. How's this for quick... I whizzed up some cauliflower florets in my mini food processor, dumped the cauliflower "rice" into a pan and sauteed it with a little drizzle of olive oil for about 8 minutes. I emptied the Progresso Chili pouch into a saucepan. It takes 5 1/2 minutes to heat. You can microwave it too. A few years ago (long time blog readers will remember) I won a makeover in NYC from Progresso. I love their Split Pea with Bacon and Lentil soups, especially in the first few weeks after surgery, I was so sick of sweet things and those two became staples during the pureed and soft food stage. I shared that I loved those soups and a picture of myself in one leg of my pre-op pants and with a lot of votes from you guys I won. It was a blast. I took my Mum. Awesome memory. 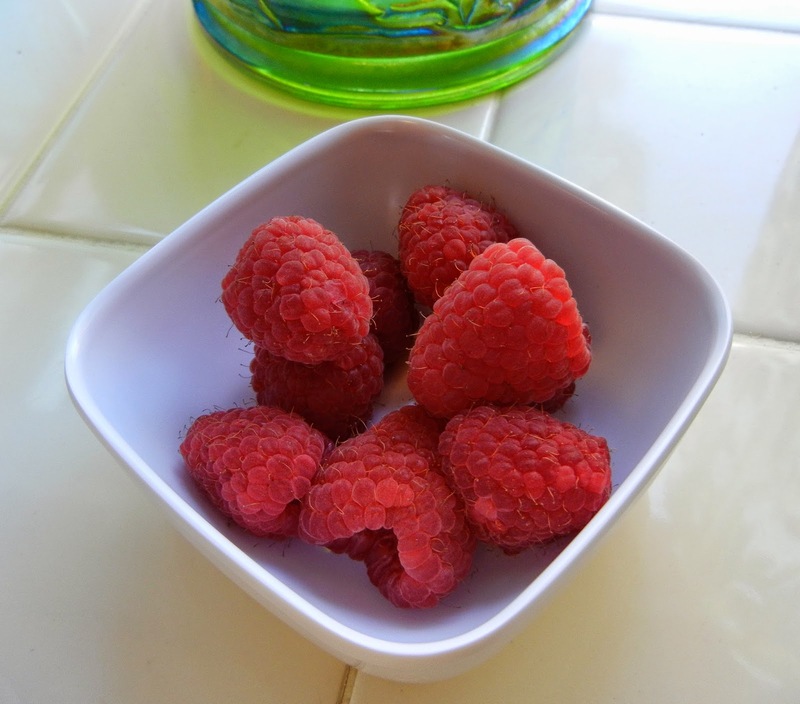 Snacks: Too much coffee and a handful of raspberries. Eggface on Twitter - I tweet A LOT. Articles, tips, resources, deals I hear about. I tweet about events. I take part in several health-related tweet chats a week. 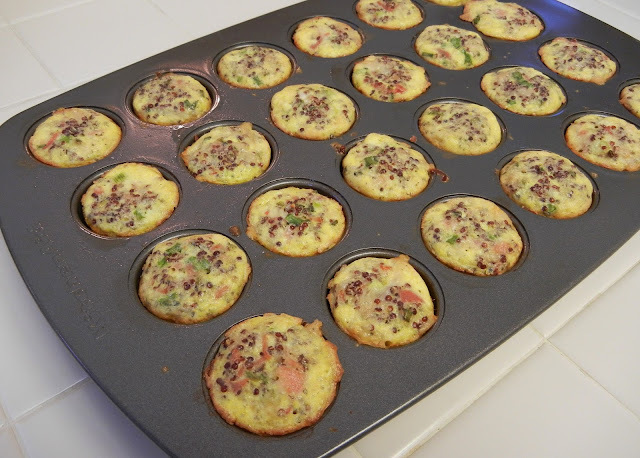 Eggface on Pinterest - Some of my favorite recipes from the blog. 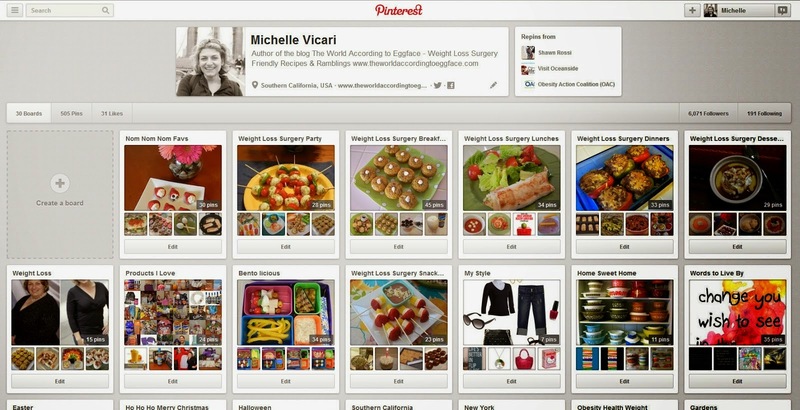 Beware Pinterest is a time sucking vortex. You can lose many hours over there looking at the pretty pictures. Eggface on Facebook - Blog announcements and other random stuff. P.S. I have something fun coming up on the blog. You might want to be sure to stop by sometime on Sunday. 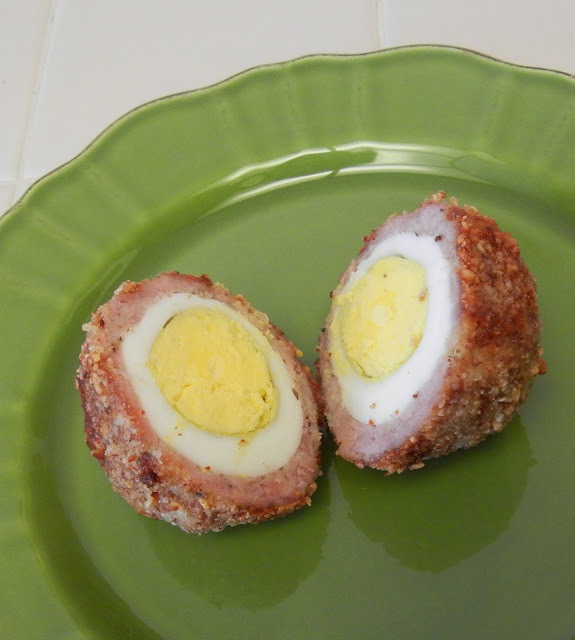 The other day a blog reader asked if I had a healthier version of Scotch Eggs. It was a bizarre coincidence because literally the day before I had been brainstorming with my Mum how I might slim down the traditional United Kingdom belly bombs. 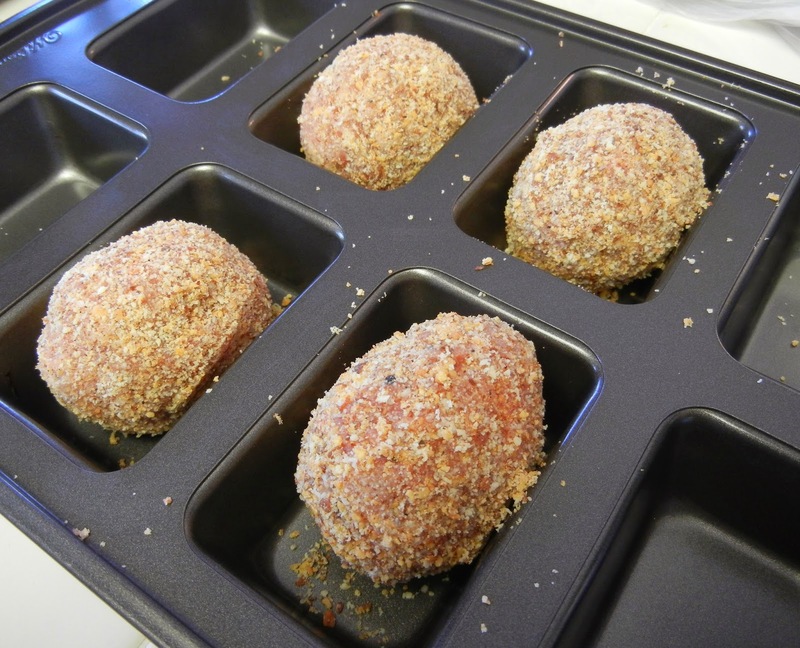 Scotch eggs are a traditional pub fair and picnic food in the UK. 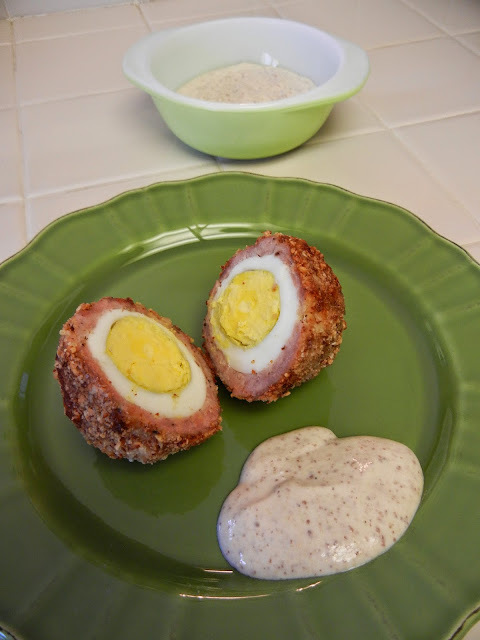 They consist of a hard-boiled egg wrapped in sausage meat, encrusted in flour and bread crumbs and then deep-fried till golden. 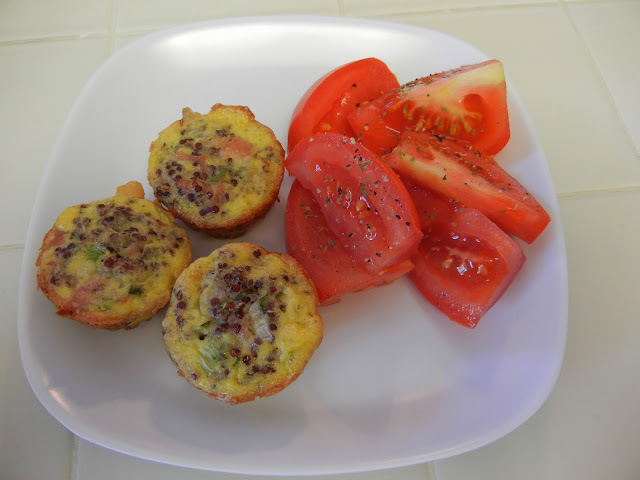 Breaded, fatty and fried is not an option in my post weight loss surgery world so here is my healthier, low carb, baked and I think more delicious version. Oh and my British Mum has given it two thumbs up. I hope my blog reader, Sue enjoys them too. Hard boil the eggs, allow to cool, peel and set aside. In a mini food processor, grind Honey Roasted Chipotle Almonds (can't find these almonds, another savory seasoned almond would work fine) till just ground. 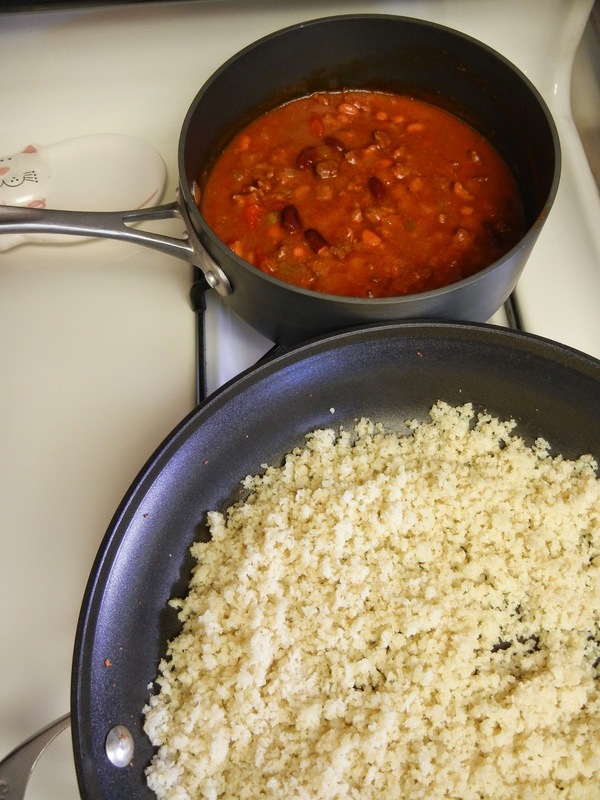 Pour ground seasoned almonds out onto shallow plate and mix with almond meal till thoroughly combined. 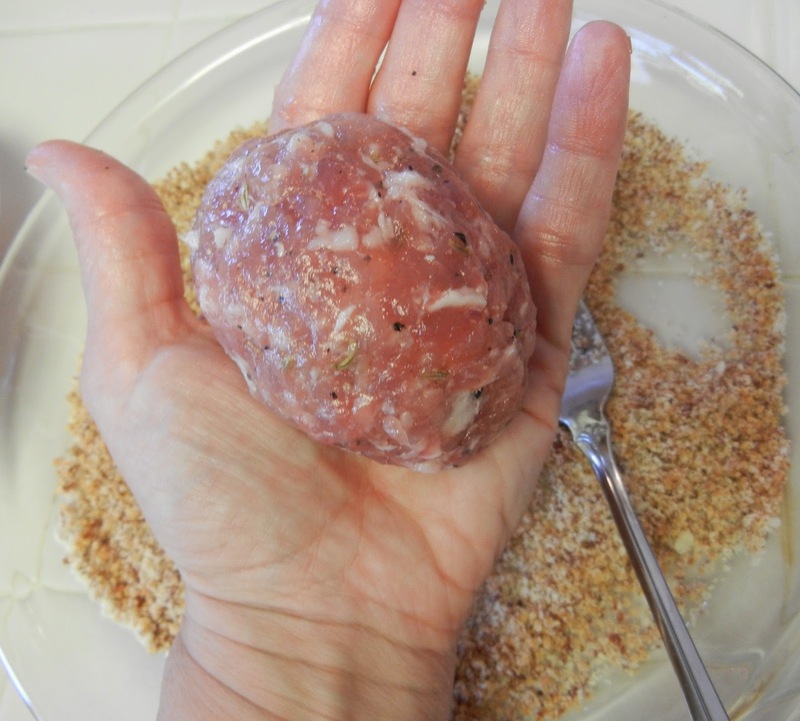 Divide the sausage meat into 4 equal portions. I used pork sausage but for an even lighter version you could use chicken sausage. Form each portion into a flat pancake large enough to fit around the egg. 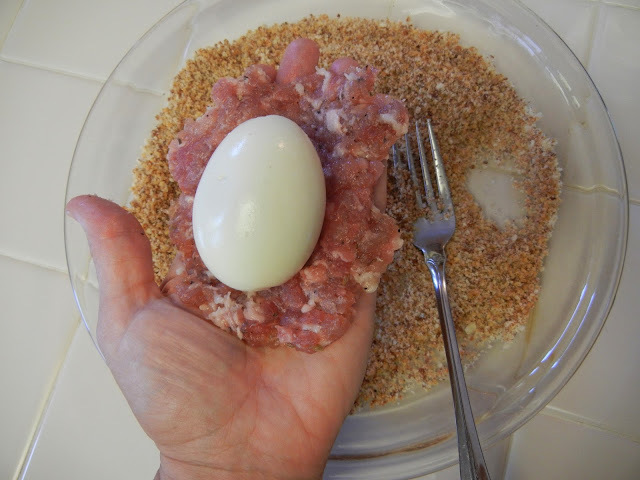 Work the sausage meat around the egg as evenly as possible. Roll your sausage covered egg into the almond crumbs. Pat them a bit to be sure they are stuck and completely coated. Place on a non-stick baking pan. 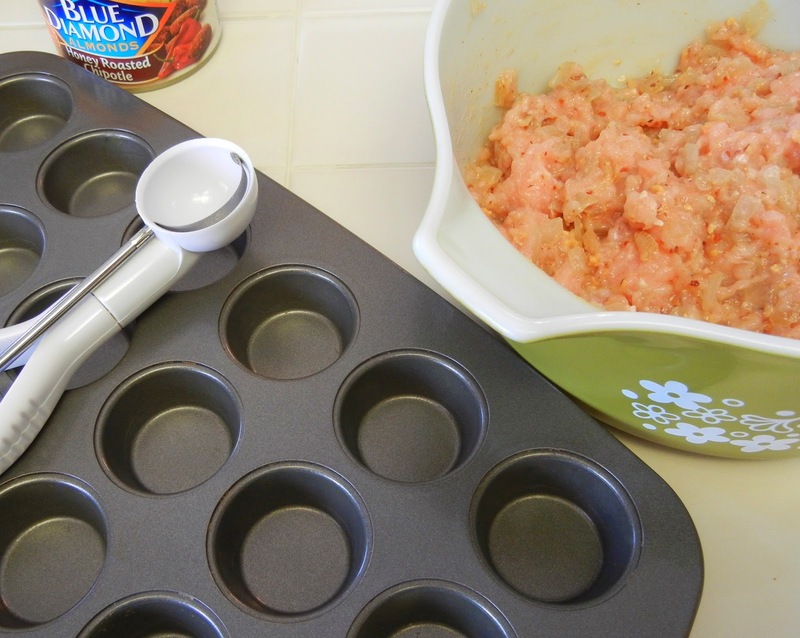 I used my mini meatloaf pan so they didn't roll around. It worked out perfectly. Bake at 350 for 20 minutes, flip and bake 10 minutes more. Allow to cool slightly and serve plain or with my Mustard Yogurt Dip. Mix together till well blended. 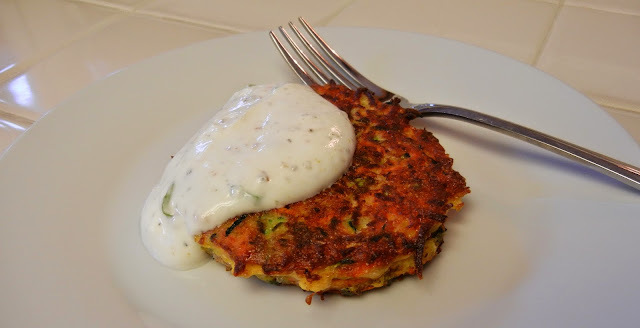 These are soooo good and really are a complete meal on there own but a simple green salad would go nicely with them too and would be perfect for an end of the summer picnic. 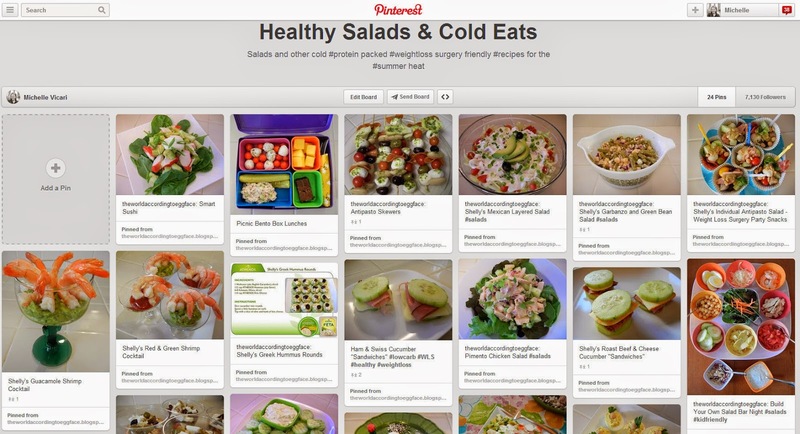 Check out my Healthy Salads and Cold Eats Pinterest Page for oodles of no-cook (or minimal cooking) cold salads and other protein-packed recipes for when the summer heat is blazing or as part of a weight loss or post weight loss surgery diet. 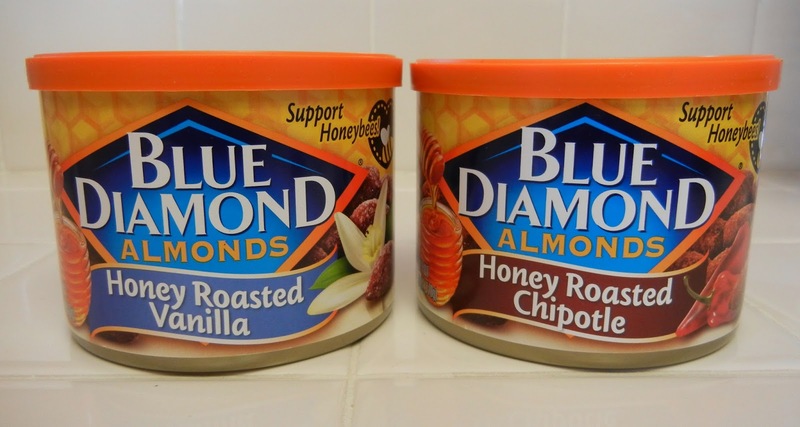 I recently was given the opportunity to try a couple of new flavors of Blue Diamond Almonds and share my thoughts on their new honey roasted line. Honey + Almonds. Yum and yes! We all know how awesome almonds are health-wise and these new honey flavored almonds though jazzed up a bit are still a great choice that can be incorporated into my day. 1 oz. about 28 nuts (and that's a lot of nuts) is 160 cals and gives you 5 grams of protein. I love almonds. In fact, rarely do I not have a little snack sized baggie with some almonds in my purse or carry-on bag when traveling. 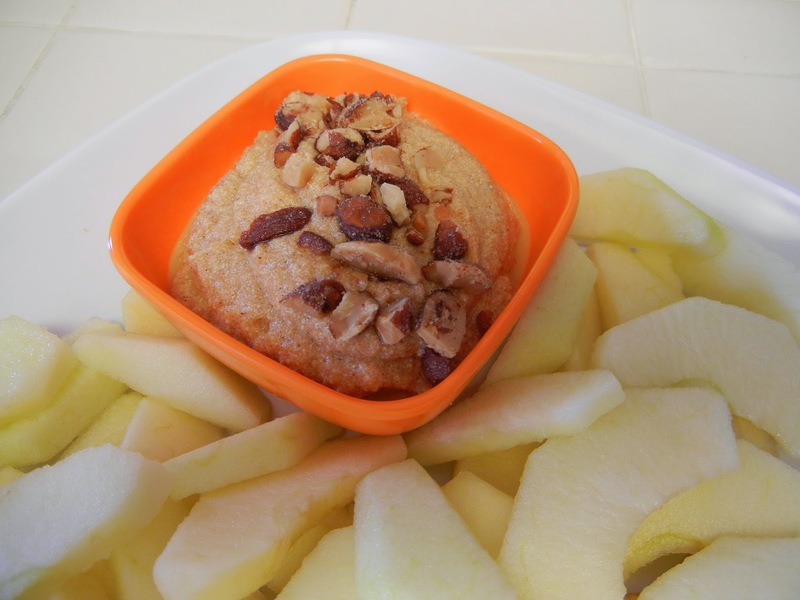 Honey and almonds are really a perfect combo. Did you know? Honey bees pollinate almond trees as well as 1/3 of the world’s food supply. Almonds are the only crop that is 100% dependent on honey bees for the pollination of its crops, every spring more than a million colonies of honey bees are placed in California almond orchards. I received 2 of the 4 new flavors to try: Honey Roasted, Honey Roasted Vanilla, Honey Roasted Cinnamon, Honey Roasted Chipotle. I sampled the Honey Roasted Vanilla and the Honey Roasted Chipotle. These new honey roasted nuts are delicious. Both. Awesome. I was a little nervous about trying the Honey Roasted Chipotle worried they might be too spicy for me (I'm not into heat) but they are perfect. It's a smoky sweet subtle heat. I LOVED them, many cans will be purchased in my future. I enjoyed snacking on some right from the can but you know I had to experiment in the kitchen with a few. I made a couple of super easy party appetizers. Stone fruits are crazy good right now at my Farmer's Market (another thank you to those honey bees doing their thing.) 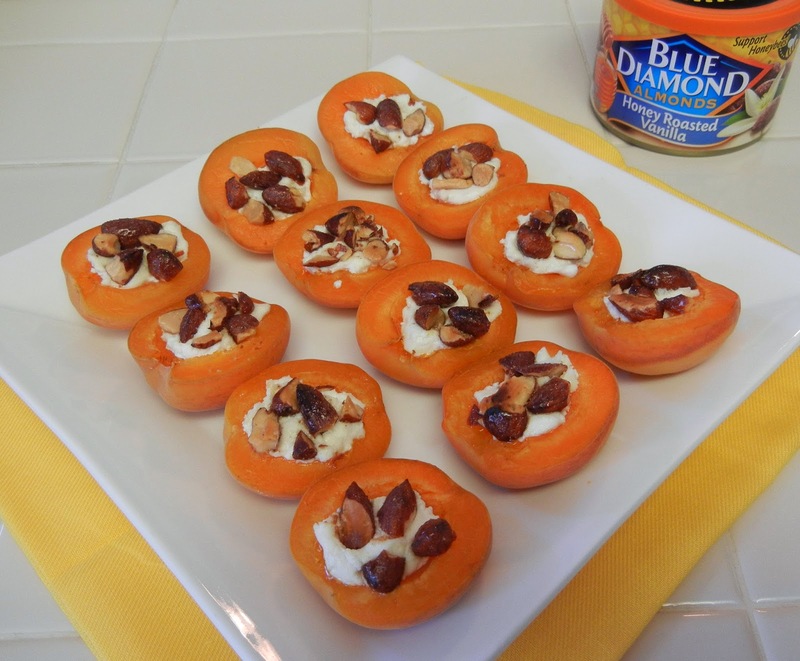 I picked up some apricots on Saturday and they were perfect for this 3 ingredient appetizer. Wash your fruit. 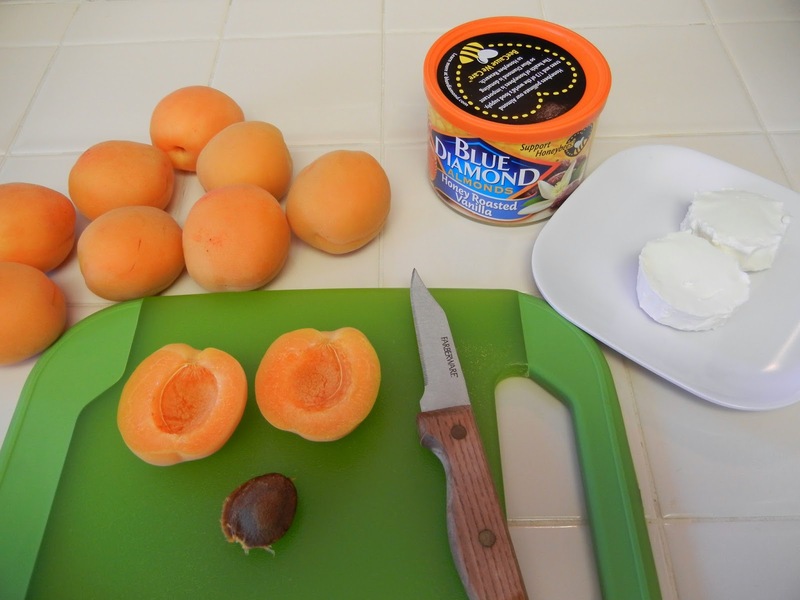 Run your paring knife along the natural seam to cut the apricots in half, remove the pit (if they are ripe they pop right out) and arrange skin side down on a baking sheet. Sprinkle some of the crushed almonds on top of the goat cheese and place under the oven broiler (toaster oven would work too) for about 5 minutes till the cheese is bubbly, apricots are warm and you begin to smell the nuts toasting. These would be great at a party. I love party snacks that are about 2 bites with no mess and taste great even after they cool a bit. Also these are perfect if you have some vegetarian party guests. Saute onion till golden. Set aside to cool. 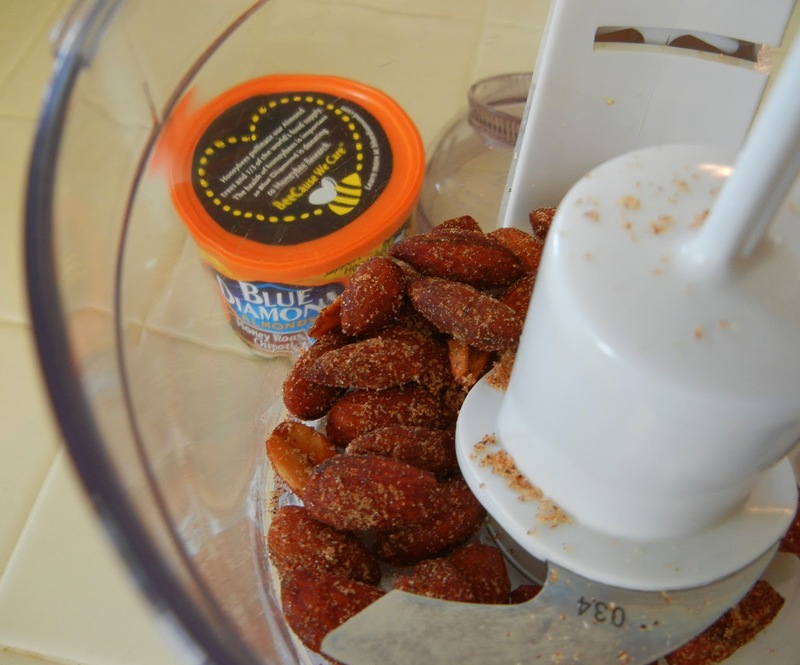 Whiz almonds in a mini food processor till ground. In a large bowl mix turkey, cooled onions, ground Blue Diamond Honey Roasted Chipotle Almonds and remaining ingredients till just combined. Scoop into a 24 cup mini muffin tin that has been sprayed with a little non-stick cooking spray. Bake at 350 for 20 minutes. Place under the oven's broiler for a few minutes more till golden. They pop right out. 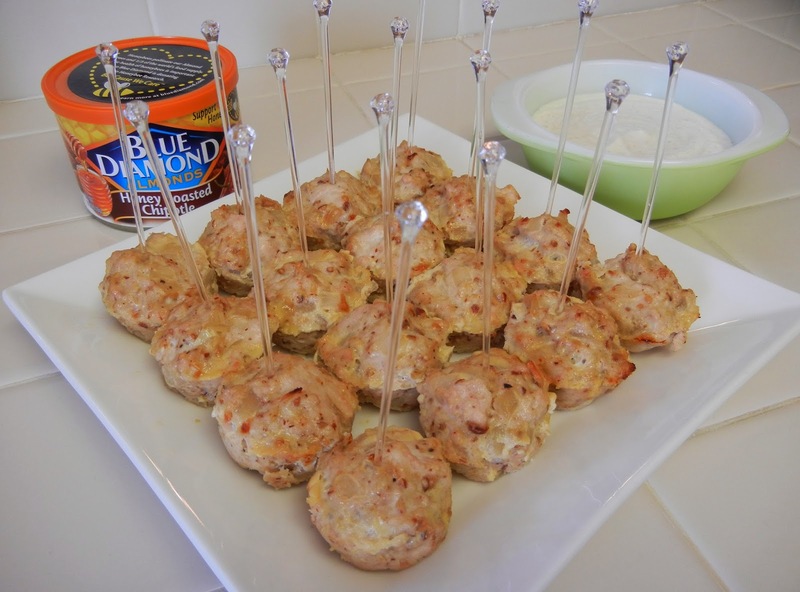 I placed a party pick in each and served them with a Greek Yogurt Cumin Lime Dip. I can't wait to have these little suckers again. So yummy and oodles of protein too! Mix together. 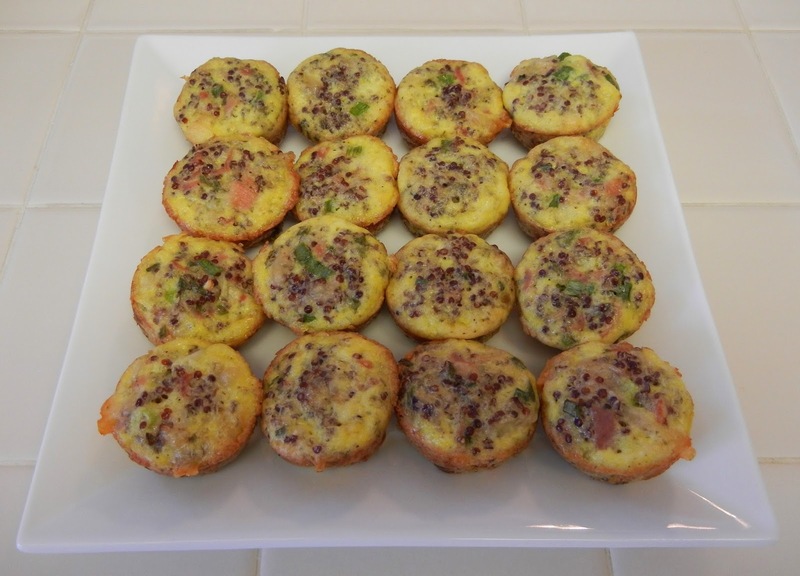 Use for dipping these Mini Turkey Muffins, veggies, or as a salad dressing. To find these new products in your area use the Blue Diamond product locator. You'll be glad you did. Oh and yay each can of nuts purchased donates some $$ to bee health research that looks at science-based solutions to honey bee challenges. "Bee" sure to check out all four honey flavors: Honey Roasted, Honey Roasted Vanilla, Honey Roasted Cinnamon, Honey Roasted Chipotle. This post is sponsored by Blue Diamond Almonds. All of the opinions are mine. 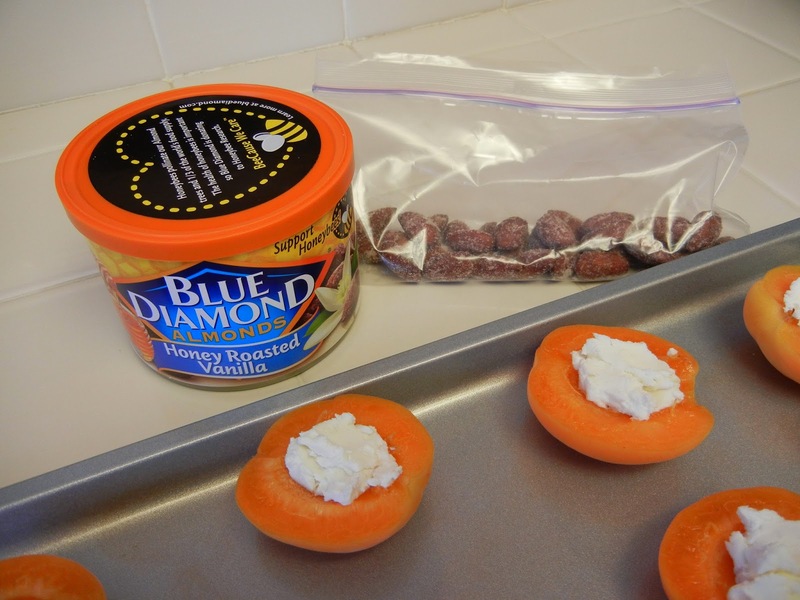 For the purposes of this post and recipe development Blue Diamond Almonds provided me with products used. Thanks for the yummy nuts. Want to learn more about all of Blue Diamond Almonds great products LIKE their Facebook page and tell them The World According to Eggface told you to stop by. Hope you give one of these recipes a try at your next shindig.